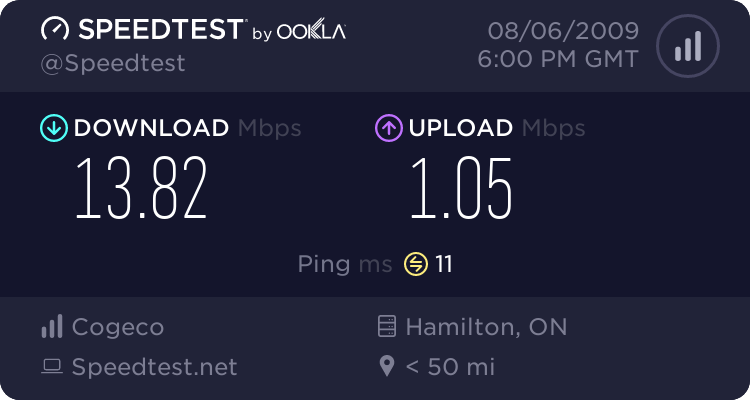 Cogeco increases speed for High Speed customers. Got this in my e-mail, and sure enough the speedtest reports i can upload at 100kb/sec now with ~1.4MB/sec down. The Internet is changing fast. Every day there are new and exciting things to see and do online. To help you make the most of your online experience, we have great news to share about your current High Speed Internet service. Your download speed is now 40% faster. So now you can enjoy more of what the Internet has to offer – faster than ever before. Everyone is trying to get more for their money these days and we’re happy to make your dollars go a little further – or faster. Of course it doesnt help that my monthly limit is only 60gb/month, but its progress.